Above is the core of my collection. Harper's Bazaar, Vogue, Elle, British Vogue and Elle UK. Beginning in 1993 all the issues are in chronological order. For now these issues are stacked until I decide on a few furniture plans. 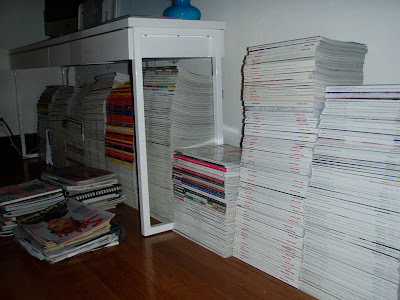 The current (2000 and on) issues of Elle, Bazaar, Nylon, Marie Claire, the fader, Living Etc., and my entire run of Lucky and Domino. The built-in hutch in the kitchen houses my books and collectible magazine issues. 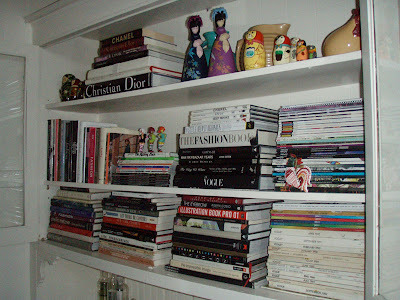 Which includes Vogue and Bazaar from the 80s, metro.pop.life, preen, missbehave, and various limited edition glossies. I am praying the weight doesn't break the hutch in half! 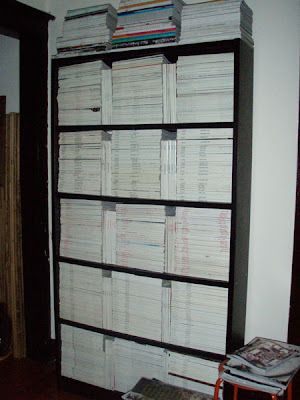 I have a shelf from Techline that buckled under the weight of pretty much the entire Martha Stewart Living run, up until about a year ago. I sold them all on ebay. I'm sure yours are sturdier and you are not doubling up, like I did. i haven't gotten to the point yet to sell my mags on e bay. i thought about it, but i'm not sure what it would take.